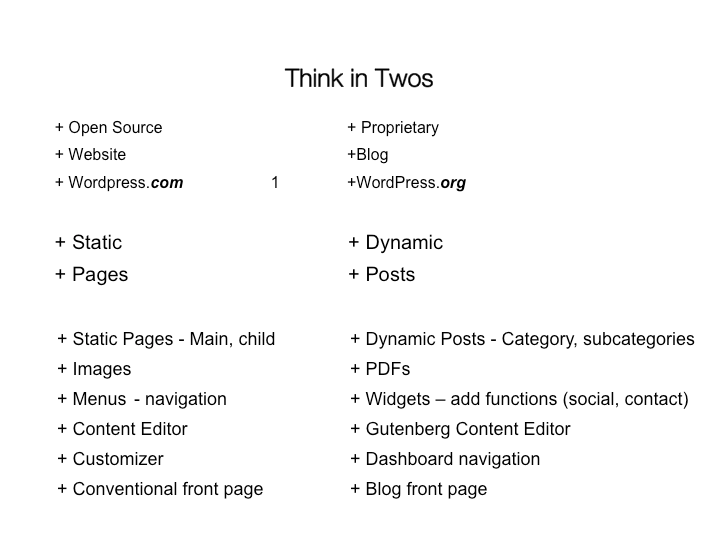 Many aspects of WordPress, if not lots of websites, can be paired. Following are links to material summarizing my one-hour “WordPress 101” at the 2017 Fayetteville WordCamp, July 21-23. The session — an introductory beginners class — covers the basics of using WordPress to create blogs and other websites for personal and business projects. This year, demonstrations are conducted in both WordPress.com and WordPress.org to create a site, activate a theme, do basic customization, then publish pages and posts. Slide Set — Beginning with The Twos table above, the PowerPoint files introduce the material I then demonstrate on a browser, The example website, Croquet Fan’s Croquet Club, while online is not real, just for use in the live demos. Copy for Site — These texts comprise the copy that I cut-and-pasted for the demonstration, plus a few websites of interest. The press release for #wcfay 2017 gives details of the overall weekend, held at the Donald W. Reynolds Center for Enterprise Development at the University of Arkansas. The above was conducted 10-10:50 a.m. Saturday, July 22. A panel discussion 4-4:50 p.m., “WordPress 101 Wrap-Up,” moderated by me, gave participants a wide range of local experts to answer any website question.